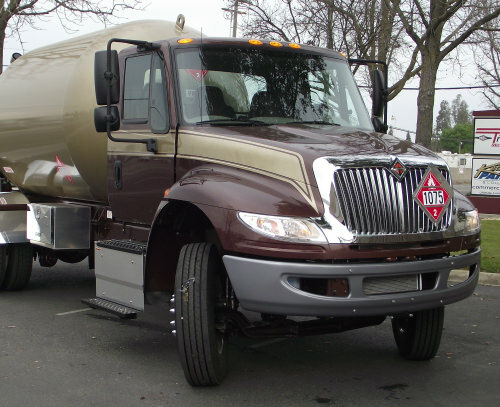 Chassis - Pacific Truck Tank, Inc. 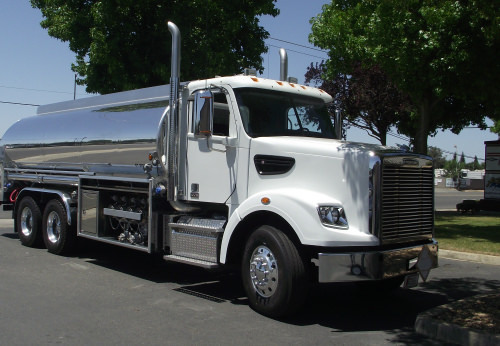 Choose from a wide range of high performance chassis from Kenworth, Peterbilt, Freightliner, Ford, Dodge, and International. 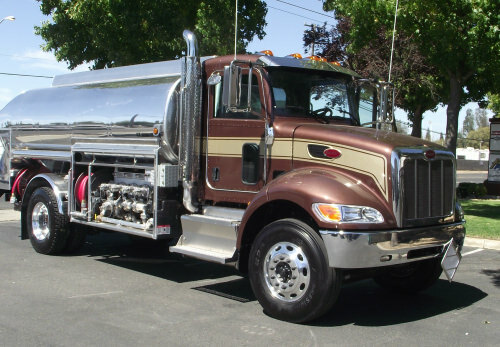 Kenworth trucks provide outstanding quality, performance, and durability. The Class 7 model is available with manual or automatic transmission, air or hydraulic brakes, the PACCAR PX-6 engine rated to 325 HP and 750 ft-lb of torque, and the PACCAR PX-8 engine rated to 360 HP and 1,050 ft-lb of torque. Peterbilt trucks are tough and versatile while offering outstanding performance and maneuverability. A full range of heavy duty suspension, brake, and drivetrain options are available. Freightliner trucks are built with dependable, customizable features and options to improve performance. The aerodynamically sloped hood of the Business Class M2 provides unparalleled visibility and room for engines of up to 350hp. The up-to-55-degree wheel cut provides outstanding maneuverability in tight urban situations. Ask us about the new S2G chassis with improved maneuverability, reduced driver blind spots, and an 8.0L LPG engine rated at 350hp and 500 lb/ft of torque. The 6.8L is the only V10 gas engine of its kind available in its class. This big-bore engine provides cost-effective operation and delivers dependable performance. 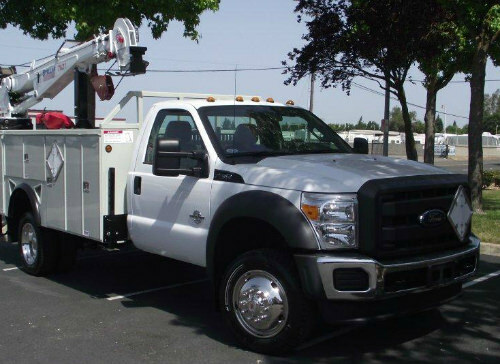 Standard on the Super Duty XL and XLT F-450/F-550 chassis cabs. Free-breathing 3-valve-per-cylinder induction system. 5-speed TorqShift automatic transmission. 362 horsepower and 457 lb.-ft. of torque. CNG /LPG Gaseous Engine Prep Package for power conversion to compressed natural gas (CNG) or liquid propane gas (LPG) Diesel. 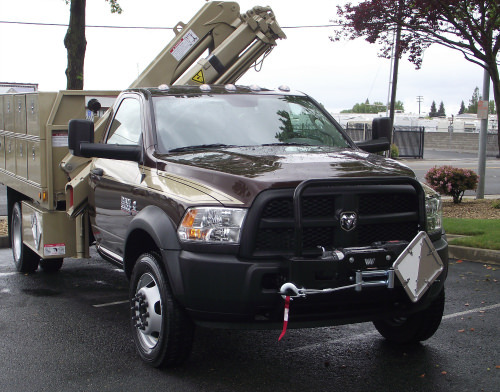 The Ram chassis cab is engineered to deliver excellence with power, performance and outstanding towing capacity. Equipped with enhanced Variable Valve Timing (VVT) to help improve torque. Interactive Deceleration Fuel Shut Off (IDFSO) shuts valves down during cruising and deceleration for optimal efficiency and performance. Available 6.7L Cummins Turbo Diesel engine is perfect if you put priority on power, as it provides best-in-class available 750 pound-feet of torque. International trucks are designed to balance the need for horsepower and weight with fuel-efficient MaxxForce engines. Choose from several possible configurations, such as the 4×2, 4×4, 6×4 or 6×6. Plus, wide-track axles provide maximum maneuverability and up to a 50° wheel cut. 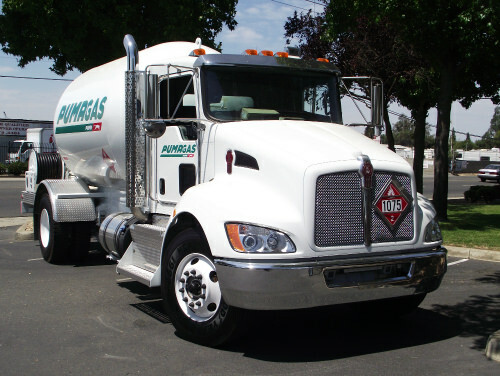 We’re here to service your petroleum and propane truck, tank and equipment needs. There is no cost or obligation to request a price quote.